I love you and this is a major reason why! You can see the big picture and you always land on what really matters. Thank you for your heart! Laura, thank you so much for this. It is so true. So often it’s hard to keep the big picture in mind of what matters most and this was a great reminder. It does matter, for our future generations! Thank you Laura! I agree! Because our bodies are the temple of God we should take care of them! My kids eat more fruits & veggies than any kids I know but I still have a long ways to go on this journey if healthier eating! Thanks for your encouragement and yummy recipes!! Thank you, Laura. You summed it up perfectly. You are such a wise woman. Thank you for this post! I admire you for so many reasons. I heard one time in my life and have taken hold of it, eat like you in The Garden. Of course I eat o other things, the garden is what I eat most of. Man made things are not nutritious as a whole and also have read in the Bible that God can make poison inert. not sure where that scripture is, I try not to test it though. Just trust that God will manage all I try to follow him with. Thank you for blogging, I look forward to each entry. Laura, I have been reading for years and never commented. I want to say that this is Godly wisdom for all and I think this is your best post yet! Thank you for speaking truth. Thinking the exact same thing last night and had that discussion with my hubby too. Keep doing what you know is good for your health and don’t give up, but keep the main things in the forefront – loving Jesus and others, (as well as having enough margin in life to enjoy family life and not rushing everywhere…) Thank you for continuing to share on Many topics, including but not limited to food! 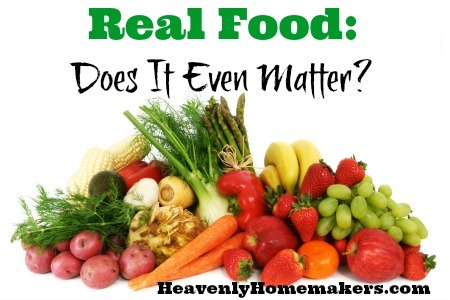 I hope all your fellow real food bloggers have a look at this and take it to heart. And thanks from ALL of us! God bless. Thank you. This gelled what has been swirling around in my head lately. God bless you Laura. I understand. This really blessed me…thank you! I snatched up one of those cast iron pots so fast it was a blur – phenomenal price. Thank you for your excellent thoughts on the value of nutrition/food. This has been on my mind much lately, as I’m focusing on reversing my Hashimoto’s, lowering blood glucose, lowering insulin, etc. through diet. I’m on an autoimmune protocol for a minimum of 30 days. This necessitates much reading, thinking about food, and planning, purchasing food. I need whole, organic, non GMO, etc. Sigh. Right now my life is all about FOOD. I have to remind myself that while intense healing requires such a heavy focus, it will not always be this way. I don’t like this out-of-balance food/self preoccupation. I love your blog, and I love your big picture perspective. We (I) long to be already neck-deep in real food living, but after two years I’ve only made a few changes that I’ve consistently stuck to. There are usually just excuses, but sometimes some really good reasons why this is so. For example, I sit here typing this as I recover from having my 7th child and my 1st C-section. Church family and relatives are being great at bringing us all kinds of food, but none that would “qualify” for real food. Do I care right now? NO! I’m grateful for the help. I’ve saved all your “31 Day” series posts to go back through and start to make major changes more quickly. But, thank you for always thinking beyond food to our spiritual lives and the world around us.